A few weeks ago, my employer held a series of financial sessions. To encourage employees to attend, they raffled off an iPad and a Fitbit. For each workshop you participated in, you’d get one entry into the giveaway. Initially, I didn’t have much interest in the sessions: there isn’t much to talk about when you’re 30+ years away from retirement and have no money to invest anyway. I still have nearly 7 years left on my student loans. My house won’t be paid off for another 27 years. And let’s not even talk about 2 kids and what it’ll cost to raise them to adulthood. I was also the youngest in that room. Sure, I was reminded about how Social Security also offers survivor benefits for minors if a parent dies. And, of course, there’s their disability program. But most of it was way ahead of my time. The second session piqued my interest a little more. It was geared more toward the worker with 25+ years to go until retirement, with a game plan to get you on the right course. It was a tad depressing (apparently, I’m supposed to be putting aside $10k more a year right now…). But I learned a lot, and if I manage to make it to old age without getting hit by a truck or falling down an open manhole, at least I have an idea of what lies ahead. What’s more lasting from those sessions is that I happened to win one of the prizes: the Fitbit Charge HR. I made a big show at first of how I was **so** close to winning the iPad, but let’s be honest: I sit in front of technology enough hours a day. I’m probably a lot better off the way it turned out. What have I accomplished with my fancy new Fitbit so far? Tracking my sleep (or, how little of it I accomplish). Yup, I’ve been real interested in that for a couple of weeks. At the beginning of this week, I moved on to starting to track my water intake. I did great for 2 days, then fell off the wagon on day 3 and exclusively drank coffee. Oops. This will take a while. Still, it’s evolving my mindset. People have started finding me on there, and I was invited to my first challenge this weekend: who can accumulate the most steps. On my own, I can easily talk myself out of exercise. With my pride on the line, I become a different person: a little competition does me a lot of good. So we’ll see. Maybe I’m ready to start making some changes, even if they’re very small ones for now. 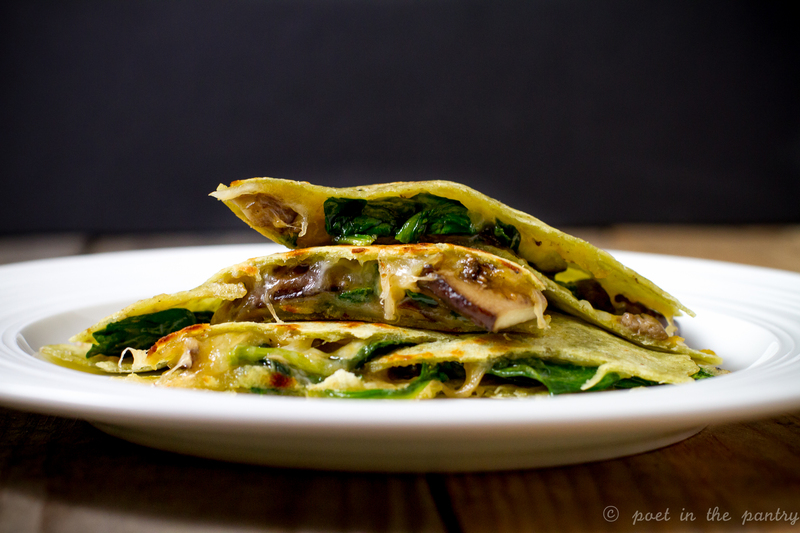 We eat a lot of quesadillas in my house. They’re quick and easy, which is the name of the game on weeknights. Typically, they’re full of cheese and pork products, with little to no vegetables. 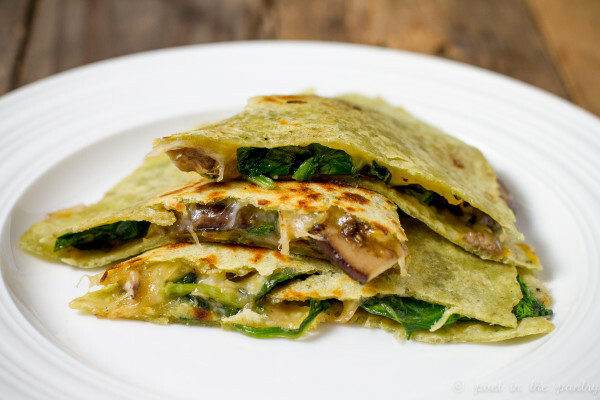 I figured I’d change things up a bit with this lovely vegetarian Spinach and Mushrooms Quesadilla. It’s bulked up with fresh mushrooms and spinach, piled on gluten free Spinach Wraps from Toufayan Bakeries. 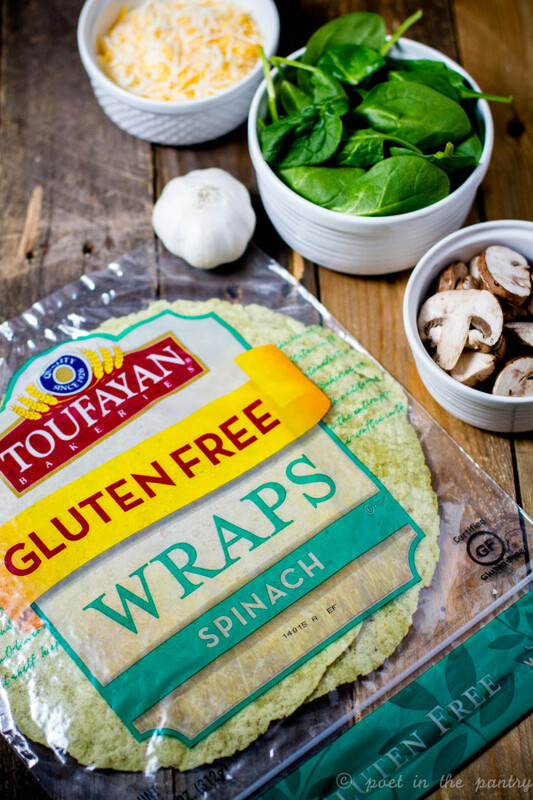 Toufayan offers a TON of gluten free options, making them the ultimate source for the celiac in your life (or, if you’re looking for alternatives to the same-old white flour wrap). I tend to keep a decent supply in my freezer, as they keep well this way. Baby steps. Together, we’ll get there. 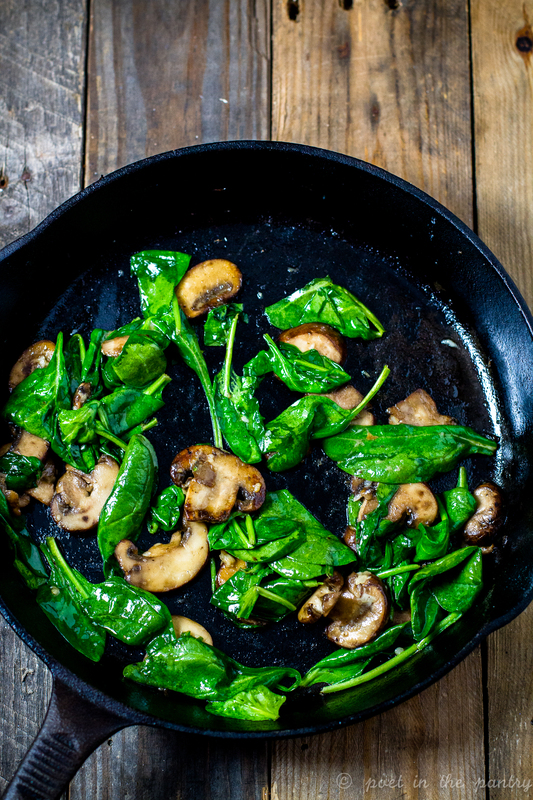 In a large skillet, heat the butter and olive oil over medium low heat. Add the mushrooms and cook until softened, stirring frequently. Add the sea salt, black pepper, and garlic clove, and toss to coat evenly. Add the spinach and cook until wilted. Remove from heat. 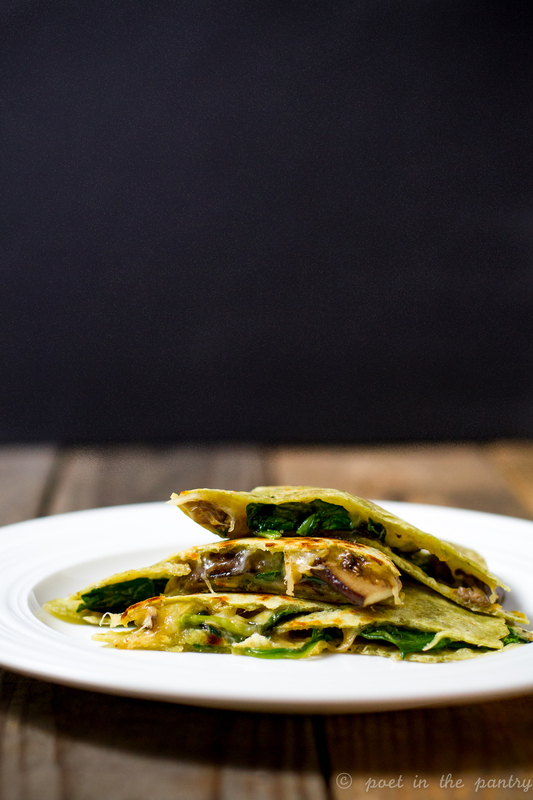 Place another large skillet over medium-low heat and layer in the pan 1 wrap, ½ the cheese, the mushrooms and spinach, the rest of the cheese, and the 2nd wrap. Cook until lightly browned, then flip over and repeat with the other side. Remove from pan, slice, and serve immediately. 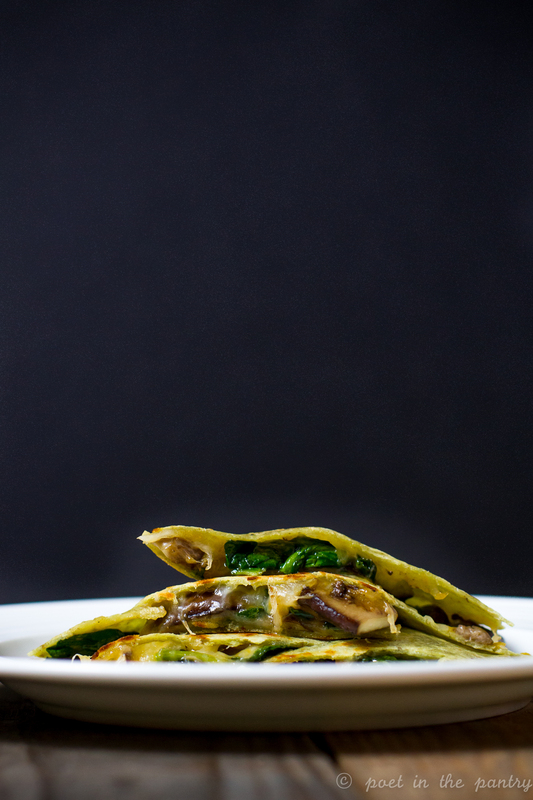 You can also garnish with a little sour cream before serving. This will yield one quesadilla that's perfect for a lunch or dinner for a single person, or sliced to serve as an appetizer at a party. You can find Toufayan Bakeries online on Facebook, Twitter, Pinterest, and Instagram, as well as on their website at http://toufayan.com/. We made a similar version last night, they were terrific. Quick, easy, and not too bad for you! Great minds here!